Everyone is back to work, and most are driving their cars again. The photo doesn’t show it, but the temperature was 23 degrees with a light sea breeze. I had a lovely cycle home. 10 years ago, this was not a critical issue – car traffic was bearable and only really noticeable during peak times. 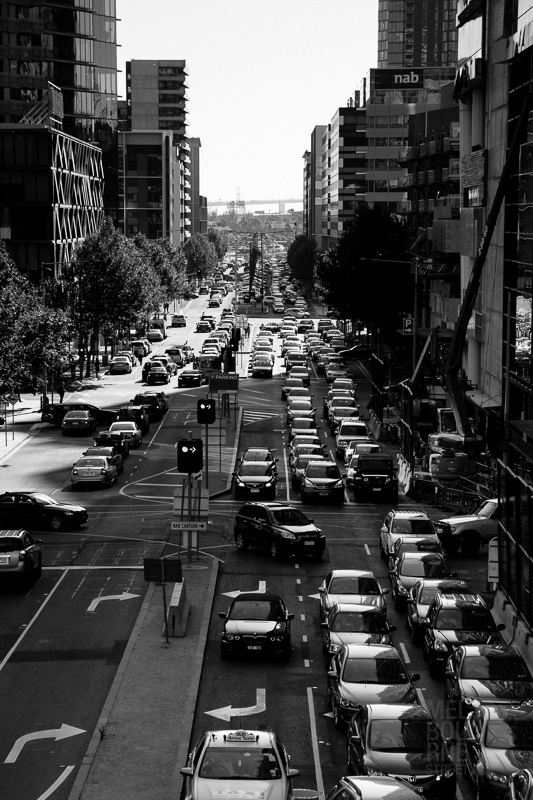 But today, after continued investment in roads at the cost of all else, Melburnians are faced with steady traffic all day, everyday from sunrise until 9/10pm. And the peak times are often so clogged that it can take literally hours to cross the city. Transport is now a critical issue for Melbourne, which politicians have recognised by proposing a truly massive investment of $8 billion for a new toll tunnel (the East-West Link). I have no doubt the new road will be a success, if success is measured by how many people use it. But numbers aren’t always the best measure of success. Such a substantial investment is supporting a rampant car culture and city spread, which will have long term effects on the health and liveability of our city. Imagine what even a $250 million investment in a comprehensive network of Copenhagen-style bike lanes would do for the inner city, the efficiency of our transport network and for making cycling safe for all. Unlikely in the foreseeable future, but hey, I can dream.